Figure 17.1. sFLC concentrations in IIMM. (A) 314 patients with IgG MM compared with 282 normal sera. (B) 142 IgA, 36 IgD and 5 IgE MM patients compared with 282 normal sera. 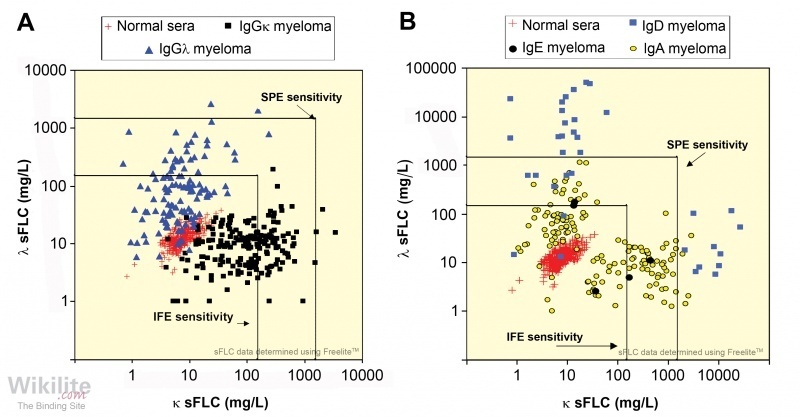 Figure 17.2 Serum IgG and λ sFLC concentrations in 116 IgGλ MM patients. (Pearson rank correlation r = -0.0037). Although IIMM is characterised by the secretion of monoclonal intact immunoglobulins, around 95% of patients have abnormal sFLC concentrations (Table 17.2) . Mead et al. assessed the frequency of sFLC abnormalities at presentation of IIMM according to immunoglobulin isotype. The study comprised 314 patients with IgG MM, 142 with IgA MM, 36 with IgD MM and 5 with IgE MM. Generally, sFLC concentrations were higher in IgA than in IgG patients, but highest in IgD patients (Figures 17.1A and B) . Overall, 89% had abnormally high sFLCs, with the following breakdown: IgG 84%, IgA 92%, IgD 94%, and all five of the IgE MM patients. Some patients had normal or reduced concentrations of FLCs, but abnormal κ/λ ratios, indicating monoclonality in association with bone marrow suppression. A study by Campbell and colleagues  characterised monoclonal protein production in MM patients with biclonal gammopathy. In the majority (93%) of cases, the dominant tumour clone expressed a monoclonal intact immunoglobulin that was associated with monoclonal FLC production in 90% of cases, while a minority (6.9%) expressed FLCs only. In contrast, all minor clones expressed monoclonal intact immunoglobulins, which was associated with monoclonal FLC production in only 16% of cases (Section 7.8). Table 17.2. Summary of studies showing the percentage of IIMM patients with abnormal κ/λ sFLC ratios. 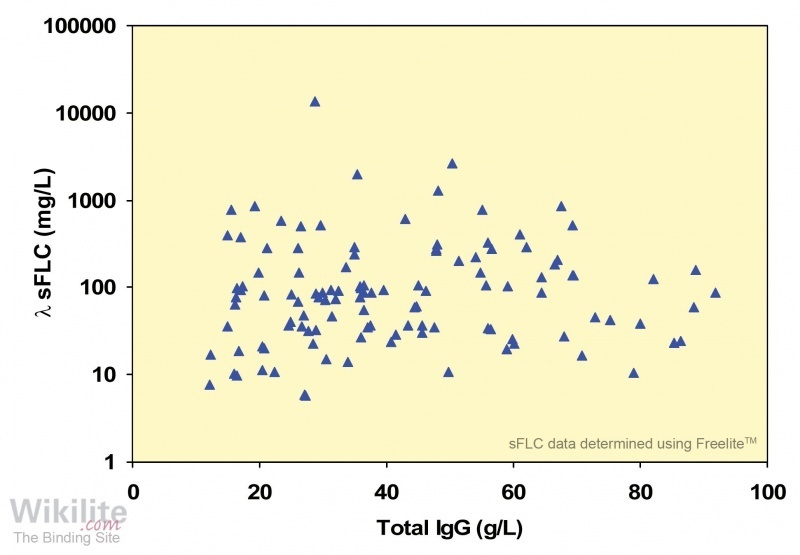 It is noteworthy that the concentration of monoclonal immunoglobulins and monoclonal FLCs are not correlated in IIMM patients (Figure 17.2). However, in the majority of cases, changes in the intact immunoglobulin and the FLC are concordant (Chapter 18). Importantly, discordant responses may indicate the presence of multiple clones, which have been identified by Ayliffe et al. in a proportion of MM patients, using dual staining immunocytochemistry. In 82% of MM patients, single populations of cells were present that expressed either intact monoclonal immunoglobulin (with or without monoclonal FLC co-expression [74%]) or monoclonal FLC alone (8%). However, 18% of the samples contained a mixture of both cell populations . Therefore, measurement of both monoclonal intact immunoglobulins and sFLCs in IIMM patients provides information on the underlying tumour cell clones, which may evolve differentially over the course of the disease (Chapter 19).